Welcome to Wide Angle Software's TouchCopy 16 User Guide. This document will guide you through the steps to using TouchCopy. TouchCopy is designed to help you get the most out of your iPod, iPod Touch, iPhone or iPad. 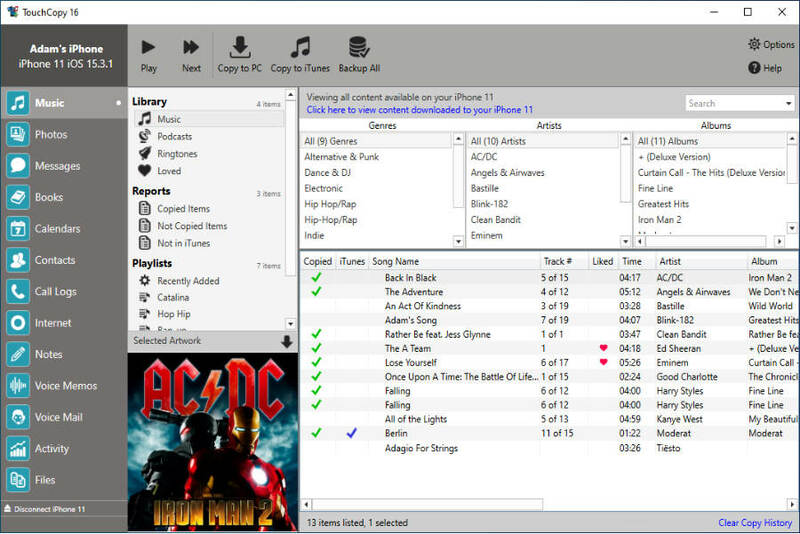 With TouchCopy you can back up your music to iTunes or your computer. But that's just the beginning, TouchCopy can also copy Books, Photos, Contacts, Calendars, Call Logs, SMS messages and just about anything on your iPod or iOS device. These help pages will guide you through using TouchCopy and point out some of the cool features the program has. Up to 100 downloads and transfers are allowed. Copying of non audio or video content blocked. All of these restrictions are removed when the demo is registered. See the TouchCopy Terms and Conditions for more information.